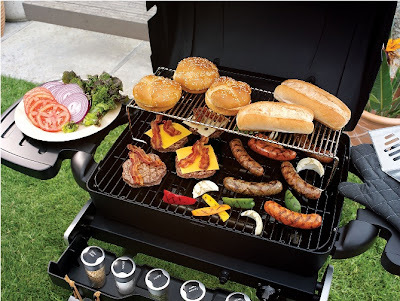 With Memorial Day right around the corner, the 4th of July coming soon, and a whole summer full of cookouts, picnics, and barbecues on the horizon, the nation is gearing up to fire up the grill for their next meal. However, whether you (or someone in your family) is a grilling novice or expert, it is important to keep in mind all the importance of staying safe while also having fun. No one wants to end their family reunion with a trip to the hospital for food poisoning, right? So there is no better site to look to for advice than from NSF International, a nonprofit organization that is committed to protecting public health and safety by developing standards and certifying products against those standards. a. Placing wet sponges in the microwave for two minutes once per day and replacing them often - every two weeks or more as needed. A better option for kitchen cleaning are dishcloths, towels and rags. 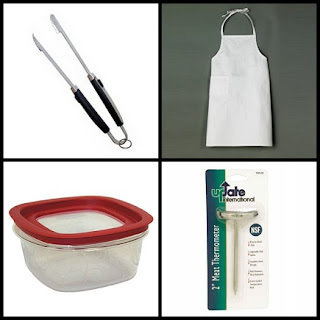 These items can be sanitized by washing on the clothes washer's hot water cycle with bleach. Replace every 1-2 days. Option 1 - Place covered food in a shallow pan on the lowest shelf of the refrigerator. Option 2 - Defrost the food item in the microwave, but keep in mind that you must finish cooking the food immediately thereafter, as some areas of the food may become warm and begin to cook during the microwave defrosting process. Option 3 - If there is not enough time to thaw frozen foods, it is safe to cook foods from the frozen state. However, the cooking will take approximately 50% longer than the recommended time for fully thawed or fresh meat and poultry. 4. Keep Hot Foods Hot and Cold Foods Cold. Hot foods need to be kept at temperatures above 140°F and cold foods less than 40°F. Between these two temperatures, bacteria can multiply very rapidly and reach dangerous levels in as little as two hours. 5. Don’t cook with your eyes; Cook with a thermometer. In order to ensure food has reached a safe internal temperature, always use a certified food thermometer. Any leftovers should be put away within two hours (one hour if the temperature is over 90°F). 6. Avoid Cross Contamination. Since bacteria can easily spread from one food to the next via dripping juices, hands, or utensils, think ahead to avoid cross contamination. Don't use the same utensils and plates for raw and cooked foods, and always remember to wash your hands before preparing and consuming food. If your plans for Memorial Day and the rest of the summer include grilling, these are great tips to remember to keep your family safe! One lucky person will win a Safe Grilling Prize Pack! To enter to win: Tell me your favorite grilled meal. Do you cook up anything more creative than burgers and steaks or does your family prefer the classics? Giveaway will end on June 15th at 11:59pm CST. Do me the favor of leaving an email address or making absolutely sure it is visible in your profile, I have to have a way to contact the winner. The winner will be chosen by random.org and announced here as well as emailed and will have 48 hours to contact me or respond to notification or a new winner will be chosen. This giveaway is open to U.S. residents only. A big thank you to NSF International for providing a Safe Grilling Prize Pack for me as well as for one lucky giveaway winner. The opinions shared are my own and honest and if you really need to see more, click here to see how I roll. My favorite is pork chops & corn on the cob. My favorite is chicken, with grilled vegetables then drizzled with baslamic vinegar, bananas foster with vanilla ice cream. I guess we are pretty classic, although we do enjoy soaking our corn for a few hours before we grill it on the BBQ with the shucks on. Our favorite is sirloin steak that has been marinating in Wish Bone Robusto Italian Dressing for a couple of days. I like my hot dogs grilled. Oh I love my grilled chicken sandwich with the works and chipolte they are scrumptious! I love my hamburgers, love a classic burger. MANDATORY ENTRY: My family and I are pretty BORING! The only thing we grill are burgers, hot dogs, and MAYBE a steak or two. See, pretty boring! To make things worse...for sides with our grilled meat, I will purchase potato salad or macaroni salad, some sort of salad in a bag, can of baked beans, and/or anything else already prepared - just serve because I DO NOT cook. My favorite thing to grill is artichokes! My husband usually just grills steaks but he does a good job. We love grilling fresh fish, like salmon... with a bunch of veggies! I think eggplant, green peppers and sweet potato grill up the best! Owen's mom has a great idea with the salmon ~ love it on the grill but my speciality is leg of lamb rubbed with garlic and sprinkled with basis and oregano. AWWWW great and cooks fast. Lamb on the grill what a treat with veggies skewers. I love making grilled pizza! Steaks baked potatoes and corn on the cob! I made the best burgers ever the other night! I don't know if it because of the new grill being charcoal or the special slider spice kit I got...or both. But that is my new favorite!! i like to grill hamburgers or steak the best. m.danielson5@yahoo.com Michelle D.
email subscriber (1) m.danielson5@yahoo.com Michelle D.
email subscriber (2) m.danielson5@yahoo.com Michelle D.
My hubby and kids love burgers and steaks, but my fav is all kinds of grilled veggies! I lov doing Shish Ka Bobs, and corn on the cob. We love steaks, burgers, ribs, and chicken, but the pork chops are at the top of our list. Hubby marinates them in brown sugar.MMMM!! My family are not chef's but simple and tasty is good enough, steaks/pork chops/burgers/sausages are our main grill companions. that would be: grilled till black polish sausages,sauerkraut,grilled buns,grilled corn on the cob & grilled rubbed with olive oil & garlic, cumin sliced thick potatoes. barb g. directorylanesuperstore(at)gmail.com It's the perfect combo plate. I love kabobs of any kind and sweet corn on the cob. My favorite grilled meal is Chicken kabobs! We love to grill hamburgers,pork chops, this weekend we are doing cornish hens! One of our favorite grilled meals is grilled marinated salmon with grilled corn on the cob and asparagus.